Doctors Find It Hard To Talk About The Downsides Of Certain Cancer Screenings : Shots - Health News In a new study, researchers found that doctors are better at explaining the benefits of a common cancer screening that its potential downsides. But overtesting comes with risks and costs of its own. Screening for lung cancer can catch tumors but it can also produce false positives. Patients need to decide whether it's right for them, but doctors often don't know how to advise them. A study published Monday in JAMA Internal Medicine looked at how well doctors talked about the risks and benefits of lung cancer screening — and, well, they could use some help. The study was small — only 14 doctors' visits were evaluated — but it examined uncensored conversations between doctors and patients, providing a window into what actually goes on in the exam room. Published as part of a JAMA series called Less Is More, the study is part of a growing body of research on the costs — both financial and otherwise — of too much treatment and testing. "It's about a deeper issue: ... Is healthcare structured to give patients the information they need to make informed decisions?" says Dr. Daniel Reuland, a professor of medicine at the University of North Carolina - Chapel Hill and the senior author of the study. "Are we really committed to being patient-centered?" The U.S. Preventative Task Force recommendation calls for a yearly low-dose computerized tomography (CT) scan of the chest for adults between ages 55 and 80, who are, or have been, heavy cigarette smokers. But the recommendation comes with a caveat. It directs doctors to use what's called "shared decision-making," that is, to walk patients through the costs and benefits of getting the CT scan. The value of lung cancer screening is the subject of hot debate amongst physicians, so the most recent guidelines caution that doctors should not push for the test without exploring first if patients actually want it. The benefit of testing, of course, is obvious: detecting lung cancer at an early enough stage that treatment can prevent it from spreading. The harms can be more difficult to understand — and for doctors to communicate when they're pressed for time. In the study, researchers screened word-for-word transcripts of over 5,000 doctor's visits in a database called Verilogue. They found 14 where doctors initiated a discussion of lung cancer screening. Of those 14 visits, there wasn't a single good example of doctors explaining the pros and cons of the test. "What we see [in this study] is part of a broader problem with shared decision-making taking time that doctors don't really have to give," says Dr. Harold Sox, a former U.S. Preventive Services Task Force chair who has written widely about lung cancer screening. Many routine cancer screening tests — tests that look for cancer in otherwise healthy people — are controversial in the medical community. Prostate cancer screening, for example, has long been the subject of fierce arguments about whether the benefits outweigh the risks. And earlier research shows that many doctors find it difficult to explain exactly why the tests are so contentious. While this study did not address why physicians struggle with these conversations, Sox speculated that doctors themselves may not fully understand the dangers of screening, or might worry that questions will take too long to answer. "I know that by recommending against a test, I'm going to have a couple patients who get these cancers, and that's a really hard thing to deal with," says Nathan Hayes, a family medicine physician in Wisconsin. "Sometimes it feels easier to deal with the false positives." Hayes adds that different physicians' organizations have different takes on whether or not the lung cancer screening is worthwhile. "There's no consensus, meaning there's no right answer," Hayes says. In the 2011 study that formed the basis for the government guidelines, for example, over 95 percent of concerning spots seen on low-dose CT scans turned out not to be cancer. But patients with benign nodules still usually undergo further testing, which can be expensive or invasive, like a biopsy. For spots that do turn out to be cancer, it may be hard to know if they're slow-growing, and if people are likely to die from other causes first. Patients may also suffer from the stress of worrying they have cancer. In the shared decision-making model, doctors are supposed to explain all this to patients. But the study authors wrote that physicians' efforts to do so were "cursory at best." Excerpts from the recorded visits showed doctors stumbling over their words as they try to explain why the risks of screening, or not explaining those risks at all. 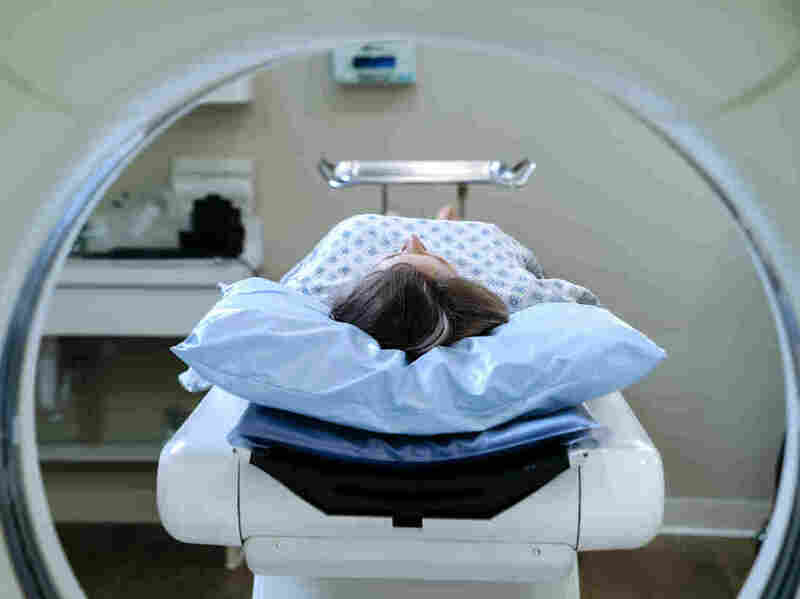 "Medicare is now paying for uh, CT scans of the chest as a screening tool, so, uh, we can work on scheduling that for you," one doctor told a patient in a conversation that researchers graded as a poor example of shared decision-making. In another, the doctor spoke at some length about the risks of lung cancer and benefits of screening. After each of the doctor's statements, the patient gave a one-word response. "This isn't a study about, 'Oh, these bad doctors,' " says Reuland, the study's senior author. The problem is "about how much time [physicians] have, how difficult it is to get all these things done." Reuland recommends that physicians use decision aids — printouts or websites with easy-to-understand language — to help explain a patient's personal risk of lung cancer and help him or her weigh it against the dangers of getting the screening test. It's hard because the chances a screening will detect lung cancer are very low, but missing a true positive could be devastating, Reuland explains. The harms of a false positive are less concerning, yet more likely to happen. "The numbers are really hard to convey," Reuland says.